I was recently invited to the Windows Mobile event in New York City. In addition to a performance by Matt and Kim at the event, I was sent a Samsung Focus phone thanks to Klout Perks. I have been able to use the phone for over a week now and have first hand experience with Windows Phone 7. I had not had any prior personal experience with Windows Phone 7, but had previously owned a Windows Mobile phone, which was a less than pleasant experience. There is a world of difference (and a number of years) between the two phones, and the newer Windows Phone is a much nicer experience. The tiles on the home screen give a pleasant experience and a nice visual interpretation of your personal data. The menus in general owe a lot to the Zune layout and slides effortlessly between screens. Screen The Samsung Focus has a 4″ Super AMOLED with an 800×480 resolution display that shows vibrant colors. Text is very clear and easily read across the apps and menus. Applications There are approximately 35,000 apps available for Windows Phone 7. While that is no where near the number of apps available for the iPhone or Android phones, it is a significant number. There are very few ancillary apps, like “fart apps,” and most of the core apps are available. Evernote, sports apps, most social networks and even games like Angry Birds are represented in the Marketplace. Battery Life While Samsung claims the Focus can last 6.5 hours with talking and up to 300 hours standby, I never tested it to those limits. With light usage, I was able to go two days without charging the phone and the battery meter was around 50%. Of course, with real usage, I would expect to be charging the phone every night. Camera The Samsung Focus has a 5 megapixel camera with 4x digital zoom. 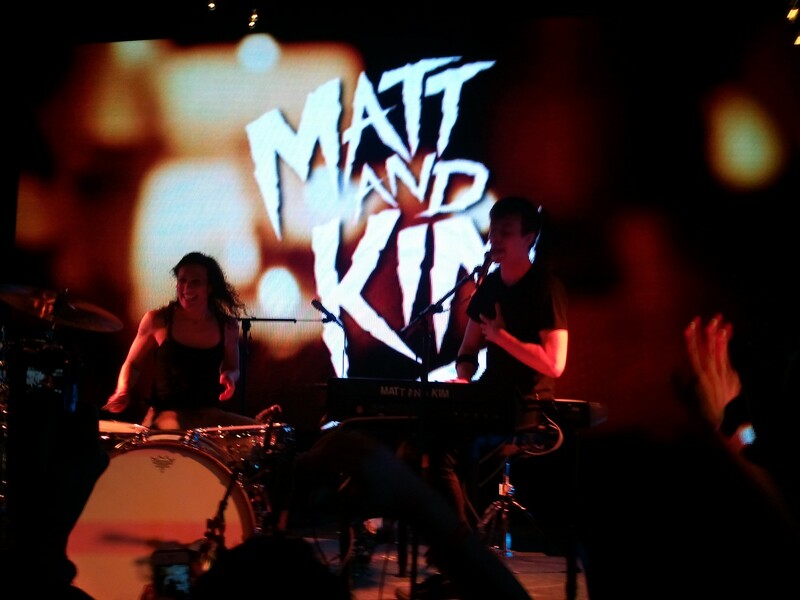 The images with the camera are very crisp and worked well even in a concert setting when I took a picture of Matt and Kim at the launch event. While I may not drop my separate camera for the phone’s camera, it’s very good for a camera in a phone. Media Player The media player in Windows Mobile is based on the Zune players, and is branded as such in the phone. music sounds good coming from the phone and the interface is easy to use. Music can easily be transfered by connecting the phone to the computer or by purchasing them on the Zune Marketplace. The phone also comes with AT&T radio installed, but requires a subscription to use, and music apps like Spotify are available to download. Keyboard The Samsung Focus has an onscreen keyboard with slightly bigger keys than the iPhone. The keys are fairly comfortable to use, but anyone with big fingers may have trouble with the keys. Phone The few phone calls I made with the Samsung Focus have sounded clear and have a very full sound to them. Recipients of the calls had no trouble hearing me in an empty room nor with moderate background noise. 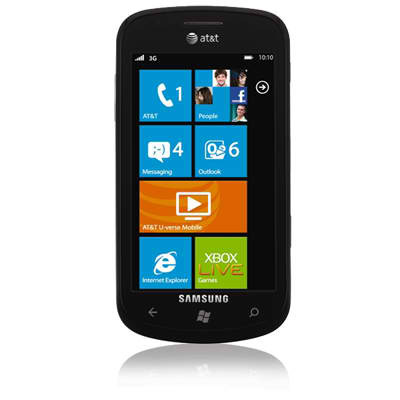 Hardware The Samsung Focus has a 1GHz, QSD8250, Qualcomm processor, which makes using the phone very smooth. The biggest problem I have with the phone is how light and plastic it feels. The lack of heft made it feel a bit like a toy and it seemed like it would be too easy to break. The Samsung Focus with Windows Phone is a phone with a good user experience, but I don’t see myself giving up my iPhone for it. I would recommend Windows Phone for those people who want an more visual experience than the iPhone and less technical than the Android. The integrated Facebook and Twitter also make for a good social experience, as does the integrated XBox Live, which will be interesting to see if any games make use of a mobile experience in addition to the console experience.